There is an increasing awareness among people these days about pollution-free environment and they are also more conscious on ways to save on their gasoline bill. With that, more and more people are constantly on the look out for eco-friendly cars that not only cause less harmful impact on the environment, it will also help them to be less dependent on fossil fuel thus countering the effects of soaring fuel prices. Finding the ideal eco-friendly car is not easy as it requires a very fair knowledge about various types of energy saving vehicles and their advantages and disadvantages. They are many reputed manufactures that have now put eco-friendly cars in their production lines, with companies like Ford, Nissan, General Motors and Toyota being at the forefront in this market. The following paragraphs will explain the features of the two popular types of eco-friendly vehicles and their advantages and disadvantages. These types of vehicles run either on gas, battery or both. You cannot drive long distances on battery alone. However, there will not be any need to stop at a gas station for fuel often. One of the well-known names in the market for plug-in hybrid type of vehicles is Chevrolet. Chevrolet has designed one of the most popular models of this type of vehicle known as Chevy Volt. Chevy Volt can easily get a distance of 40 miles drive powered exclusively by a battery per single charge and an amazing 500 miles per gas fill-up. This type of vehicle is ideal for a person who is concerned with clean environment and does not want as yet to dispense with the internal combustion engine. Chevrolet is concentrating on designing new models of plug-in hybrid vehicles in which higher capacity battery will be added to the vehicles to enable users to drive longer distances with a single battery charge. The other principal manufacturer in the plug-in hybrid market is Toyota. Although the Toyota Prius appears similar to a standard Toyota Prius, the addition in this model is the port for charging the battery. While it gives only a low mileage range of 14 miles on battery power, it gets an incredible 50 miles per gallon, when in hybrid mode. As the name implies, these types of vehicles are powered only by electricity supplied by battery and therefore, is not provided with a gasoline motor. One of the principal manufacturers of the pure electric vehicle is Nissan. Nissan has developed the most popular model, Nissan Leaf. This vehicle gets an astounding 100 miles per charge and is the first automobile manufacturer to produce more than 10,000 pure battery electric vehicles. With such an extraordinary efficiency, it is no wonder that the company has been receiving huge number of orders from both individual users and city and town public service institutions. The basic price of a 2011 Nissan Leaf is around $32,000. 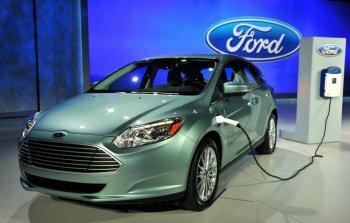 Ford, another leading automobile manufacturer has also ventured into the all electric vehicle market segment with their Ford Focus Electric. Ford has already manufactured the maximum number of hybrid vehicles than any other manufacturer and is now trying to establish leadership in the electric car category as well. The Ford Focus Electric, which runs only on battery, plans to compete with the Nissan Leaf. Just as the Nissan Leaf, the Focus Electric gets 100 miles per charge. Another advantage with the Ford Focus is that it comes at a lower price of around $20,000 as compared to Nissan Leaf. Ford plans to introduce more number of models of Focus Electric cars to cater to the requirements of diverse range of customers.